Significant money can be made in the stock market by following big trends. 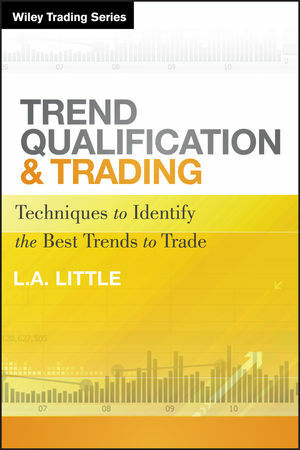 In Trend Qualification and Trading, market technician L.A. Little explains how to identify and qualify these trends to determine the likelihood that they will continue and produce better trading results. By combining price, volume, different timeframes, and the relationship between the general market, sectors, and individual stocks, Little shows how to measure the strength of stock trends. Most importantly, he demonstrates how to determine if a trend has what it takes to develop into a major move with greater profit potential or if it is basically a false signal. Filled with in-depth insights and practical advice, this guide will help you make more of your time in today's markets by providing an in-depth explanation of how to identify and qualify trends. L.A. Little is what Jim Cramer called a "technician extraordinaire" on his Mad Money television show. Little is a professional trader, money manager, and senior contributor to RealMoney.com and TheStreet.com. His columns on those sites generally receive 50,000 to 75,000 views. Little also provides daily market analysis and the tools to implement the trading strategies covered in this book on his web site TAToday.com. He has contributed articles to well-known technical trading publications such as Technical Analysis of Stocks and Commodities and Traders World. With a trading philosophy centered on capital protection first and the accumulation of consistent gains over time, Little exposes a simplistic technical approach to trading the markets that is a throwback to the days of past. Chapter 2 Classical Trend Model. Chapter 3 Neoclassical Trend Model. Fundamentals for the Long Term. Part II Application of Trend Theory. Chapter 6 Preparing to Trade. Chapter 7 Entering and Exiting Trades. Defining Entry and Exit Points. A Trading Example: Combining Technical Events. Chapter 8 Reversals and Price Projections. Chapter 10 Markets, Sectors, and the Trading Cube. Chapter 11 Trading Qualified Trends. Example of a Qualified Trend.